Kira and Dukat go looking for a wrecked Cardassian slave transport that was carrying Dukat's half-Bajoran daughter, Tora Ziyal, while Kasidy surprises Sisko with news that she might be getting a job on Bajor. The actor who plays Razka Karn, Roy Brocksmith, also played the Zakdorn Sirna Kolrami in TNG's "Peak Performance." I think one of the core problems DS9 has, as a show (and probably one of the reasons it never found as large an audience as TNG had), is teaser openings like this one. We have no idea who Razka Karn is, what the Ravinok is, and what the heck the big deal is about it all. Casual viewers might tune in and assume these are things that earlier episodes had mentioned--a fair assumption given the more serialized nature of the show--and would thus not bother waiting through the first commercial break. Even as the show is clearly trying to appeal to a broader audience at this point, it's still failing to offer opening teasers that draw those audiences in to begin with. Man, Sisko can be a big jerk. We finally get to see the Breen, albeit in full-body suits. There are a lot of similarities here to The Searchers. 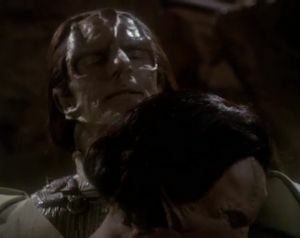 I appreciate the continued evolution of Dukat's character from the one-dimensional villain of previous seasons to the more nuanced and interesting pseudo-antagonist seen here, but this episode winds up being way too soapy. The reveal of a half-Bajoran daughter makes for an unexpected twist to our understanding of Dukat--and to Kira's as well--but it's far more melodrama than science-fiction. The B-story makes it all the worse by being about Sisko trying to muster up enough energy to get "serious" with Kasidy. Tora Ziyal remains a recurring character throughout the show, although the actress who plays her changes frequently. "Waltz" is kind of an inverse of this episode. In this one, Dukat spends some time in a cave with Kira and is made a little more human and relatable. In "Waltz," he spends some time in a cave with Sisko and is made a lot more inhuman and unrelatable. Copyright ©2014 e. magill. All rights reserved.